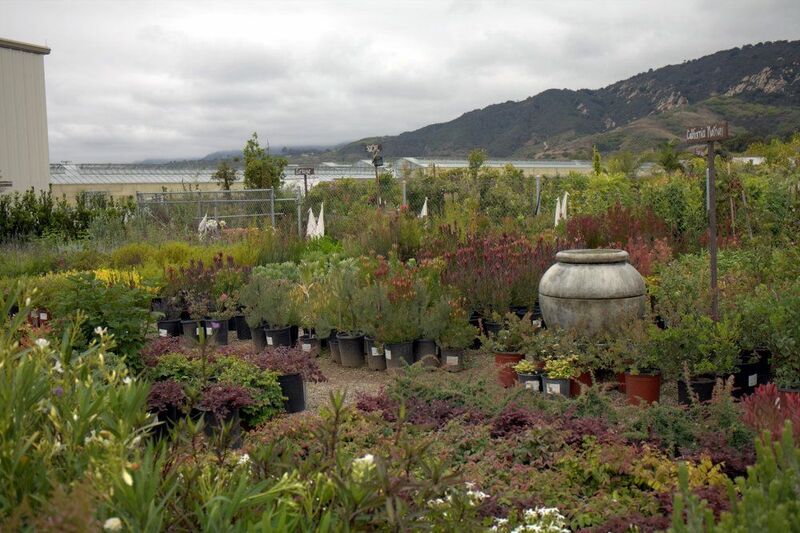 By now it’s fairly obvious that visiting plant nurseries and gardens are two of my favorite pursuits. 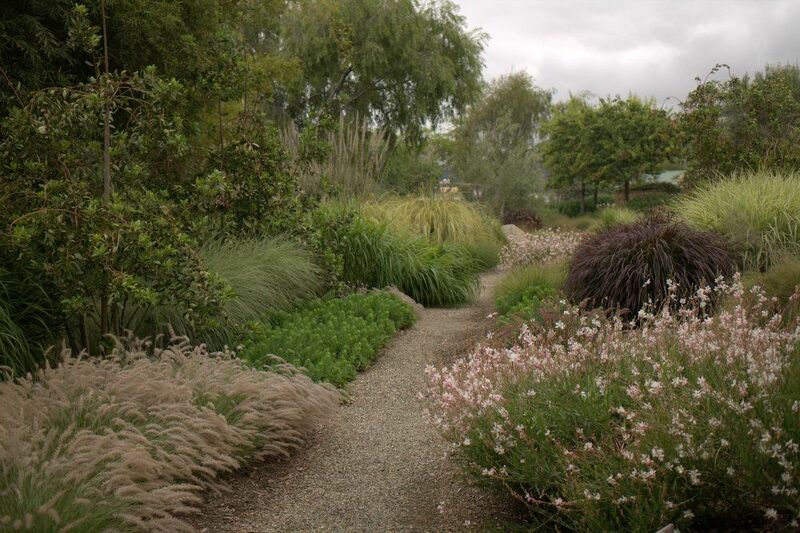 The ultimate in garden touring is possible when occasionally, though all too rarely, both pursuits can be accomplished at one location. 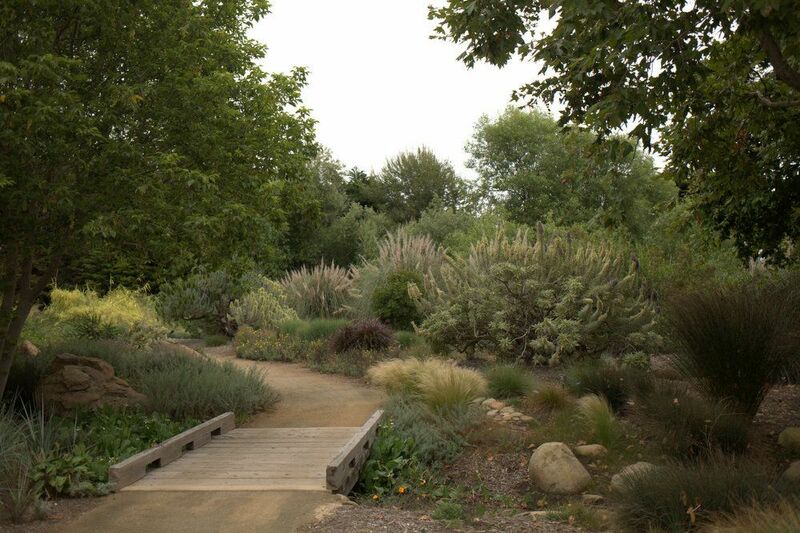 The list of West Coast nurseries with attached gardens include the fabled Western Hills and Heronswood, (both now undergoing a renaissance under new ownership), Annie’s Annuals & Perennials, the Ruth Bancroft Garden, and quite a few nurseries in the Pacific Northwest, including Cistus, Joy Creek Nursery, Far Reaches Farm, Dragonfly Farms, Dancing Oaks. I’m sure there are local favorites near you, such as Plant Delights in North Carolina and White Flower Farms in Connecticut. 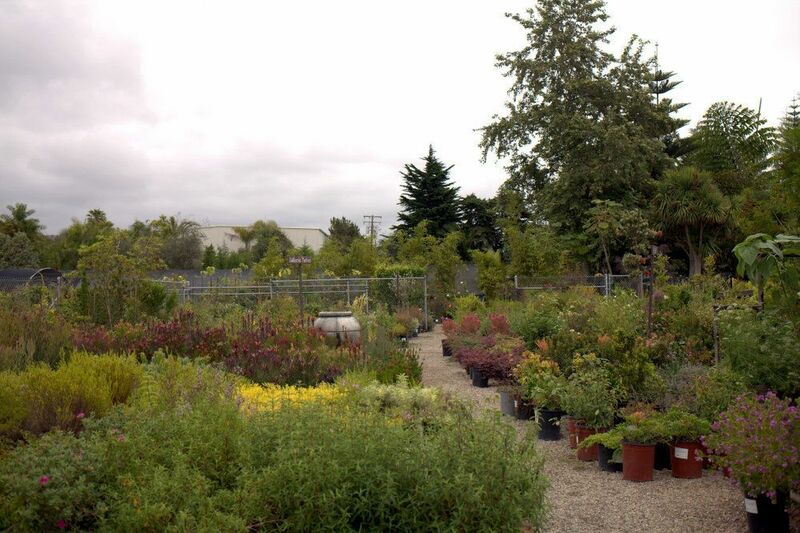 And now many botanical gardens keep a good selection of plants on sale year-round. 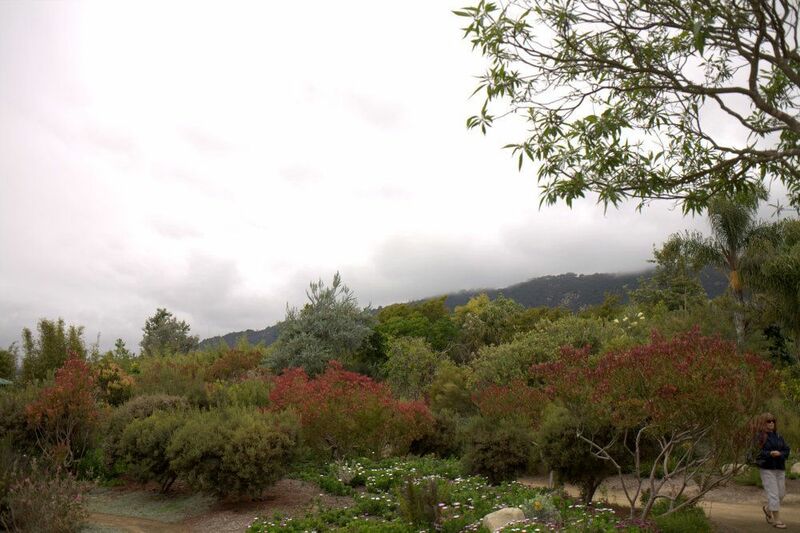 I spent a couple intensely enjoyable, moodily overcast days last week visiting nurseries and gardens in and around Santa Barbara, including Seaside Gardens near Carpinteria, which is one of those rare nurseries with excellent display gardens that is fast becoming a well-blogged nursery/garden destination. 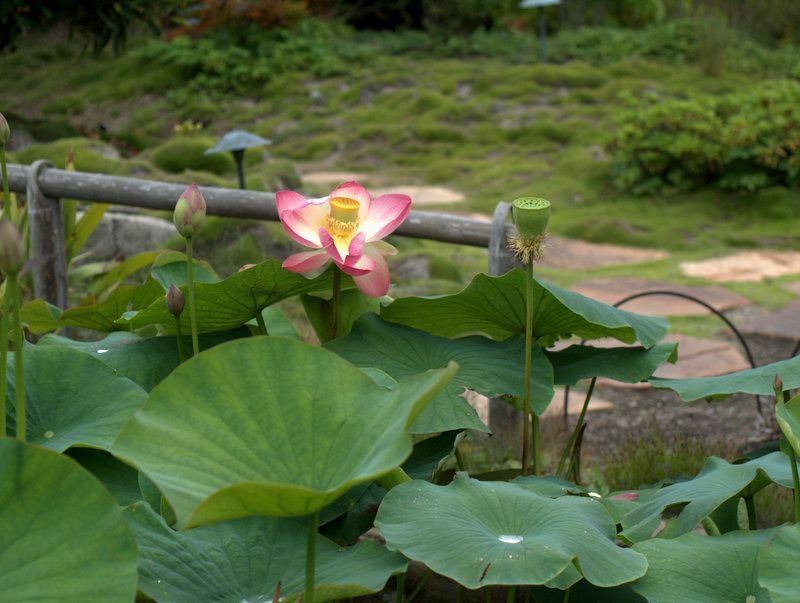 It has the kind of garden you dash in and out of to check stock at the nursery of a particular plant just seen in full, dazzling growth in the garden. In my case, it was Alstroemeria ‘The Third Harmonic.’ I grew it once, panicked at its gigantic ways, eradicated every tuber, and have missed it ever since. And it’s not been easy to find again. But there it was in bloom in a garden at Seaside. The following photos of the growing grounds are a result of asking a nice gentleman to check if he had this alstroemeria after spotting it in the garden. None were for sale in the retail section, so we took a stroll through the growing grounds to find if any were ready for sale. During our walk through row after row of the seductive building blocks of future gardens, I bemoaned my experience with TTH, its enormous size and sprawling ways. 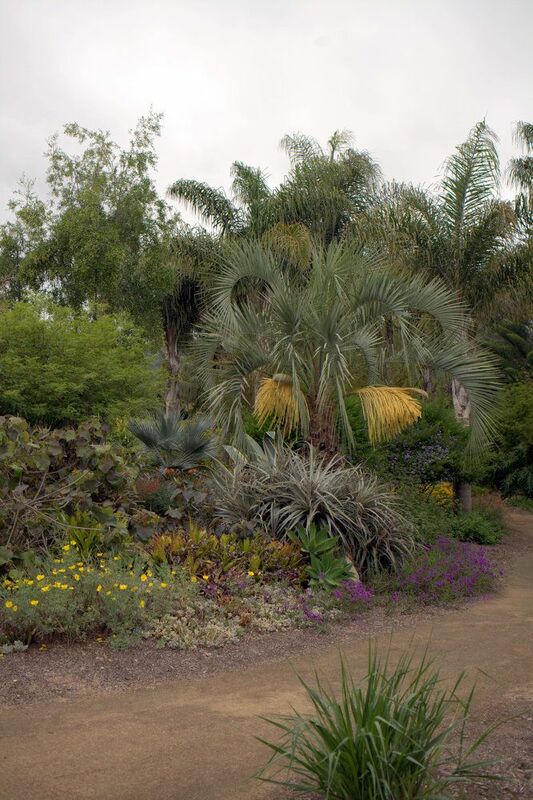 My guide said I had given it too much water, that it never tops 4 feet at the nursery and is in fact a good candidate for dry gardens. 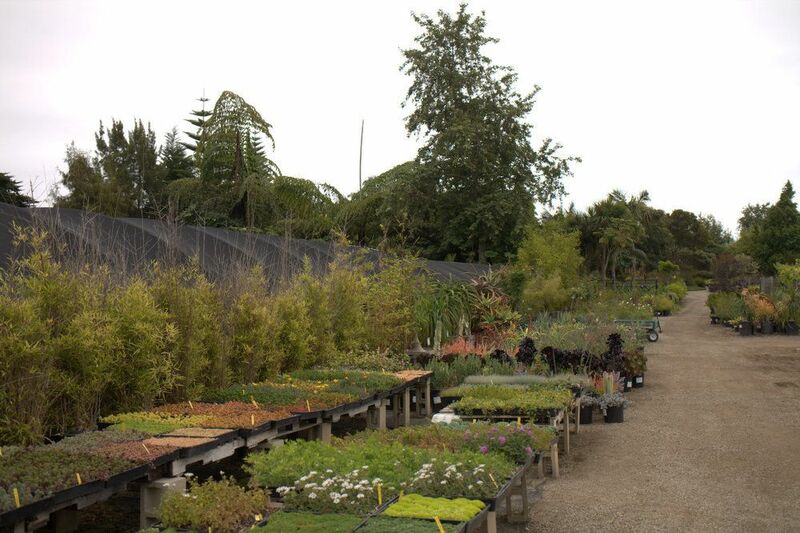 Discussing problem plants with nursery people is the best kind of talk therapy. 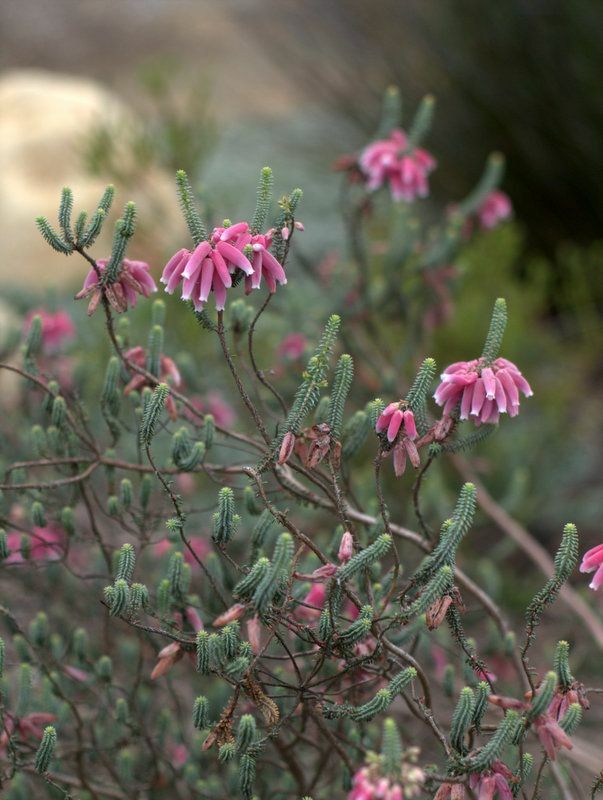 He said he began to grow these plants because nobody else would, gesturing to the many proteaceae family members. 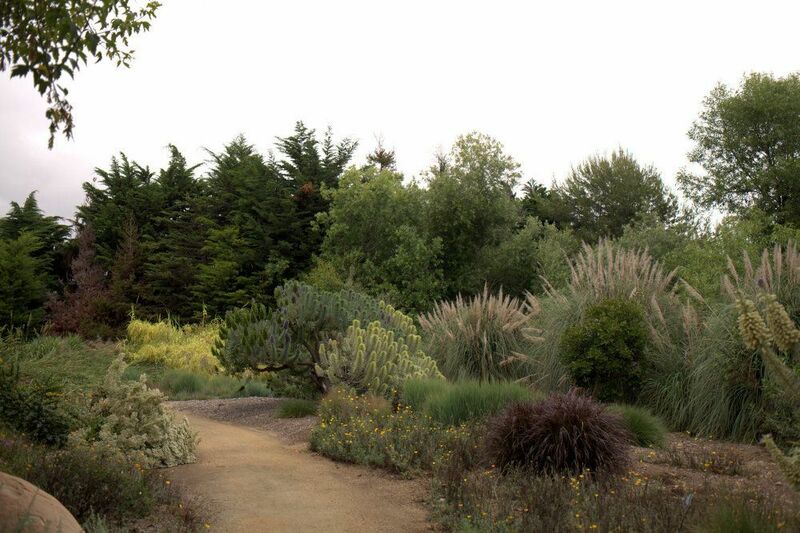 Seeing this incredible inventory of mediterranean, dry garden plants, I mentioned that the nursery was in the catbird seat now with the advent of the recent water restrictions. My guide shook his head and said he’s seen it all before. People begin to adapt to drier conditions, and then the rains return, causing the best water-wise intentions to wither away. I remember the drought in the late ’70s, and this one just feels different, like a true tipping point. 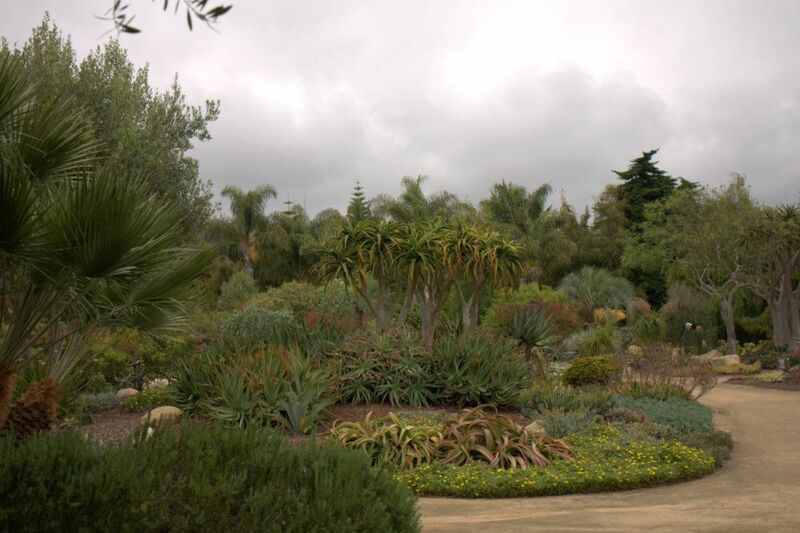 Back in the display gardens, blue sky or cloudy, winter or summer, the succulent garden is a feast for the senses year-round. 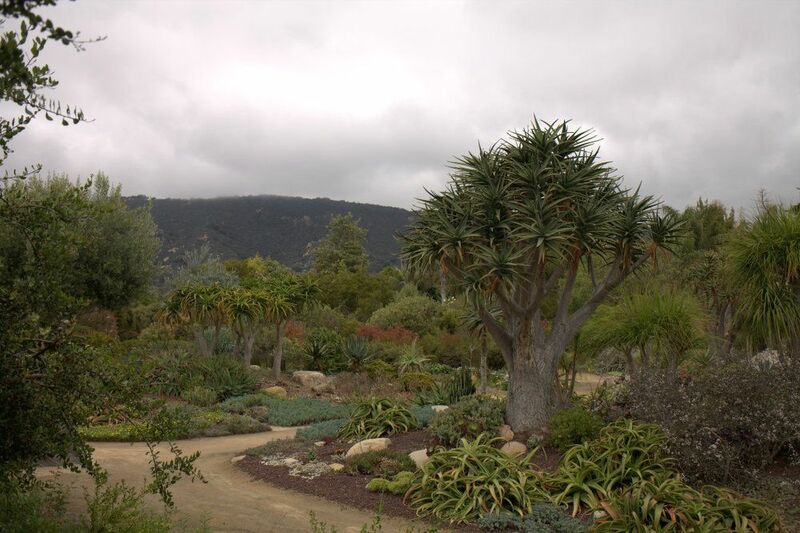 The tree aloes are the undisputed linchpins for the array of succulents radiating out from their majestic trunks. 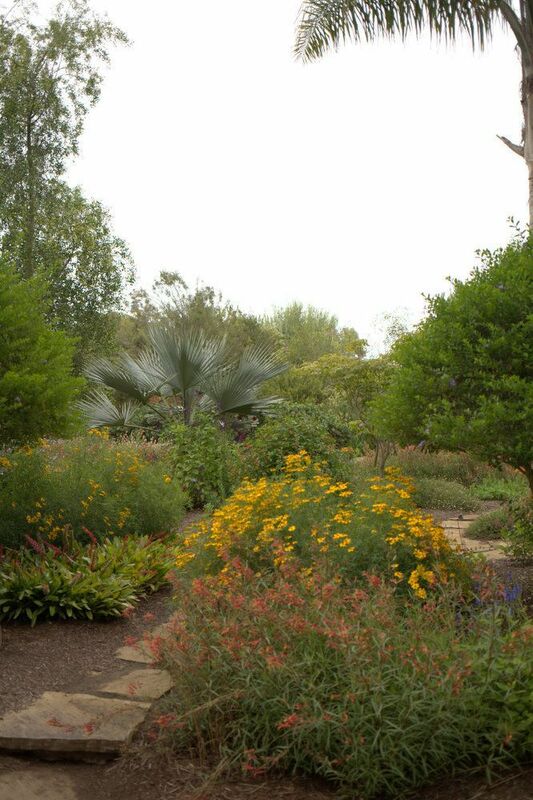 Dyckias, yellow poppies of Hunnemannia fumariifolia on the left, purple verbena on the right. 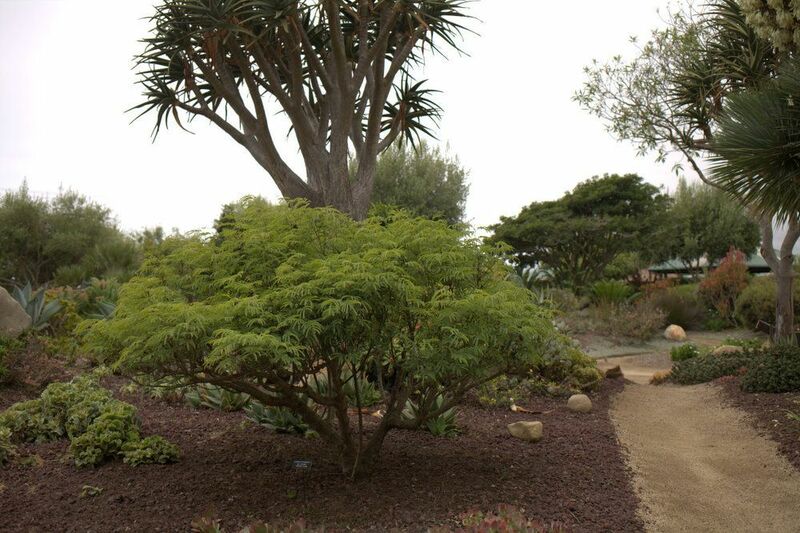 Amazing how one statuesque specimen organizes a complex planting. 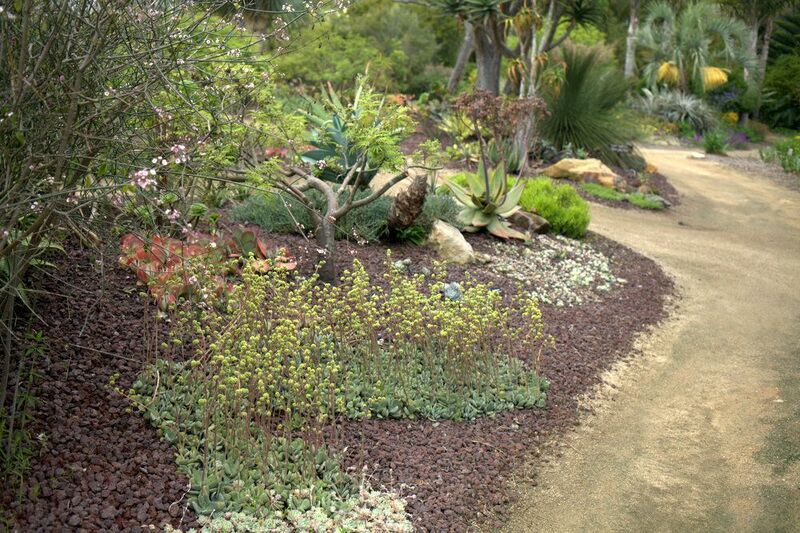 With Lobelia laxiflora and Tagetes lemmonii in the foreground. 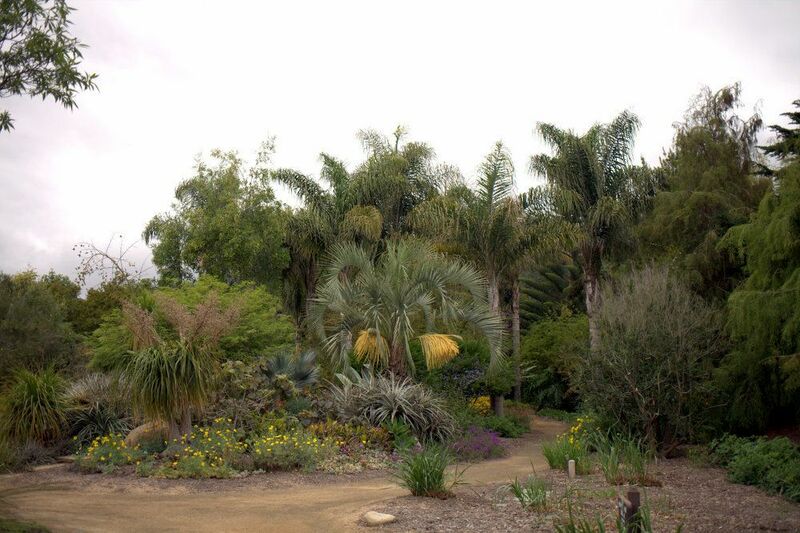 In the Central/South American garden. 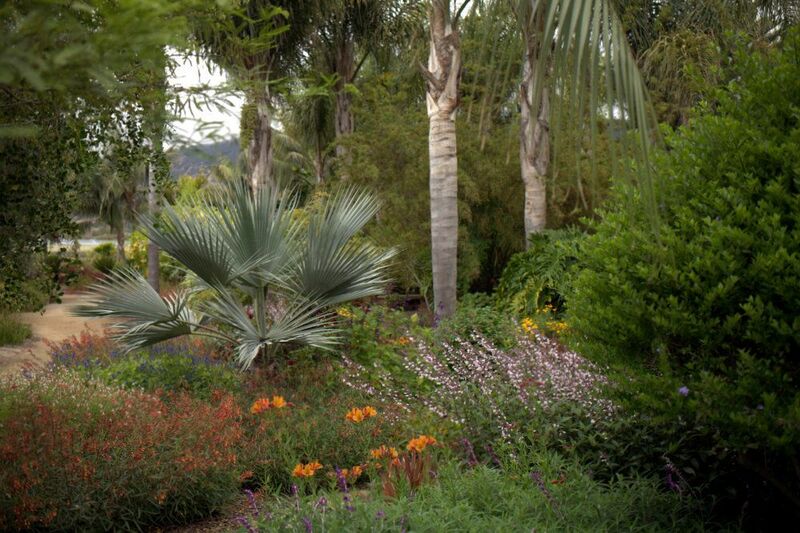 I think this is the Mexican Blue Palm, Brahea armata, foregound with Lobelia laxiflora, Alstroemeria ‘The Third Harmonic,’ Salvia ‘Waverly,’ Salvia leucantha. Must be up those stairs where that gigantic brugmansia’s human sacrifices are led. How else could it grow so big? 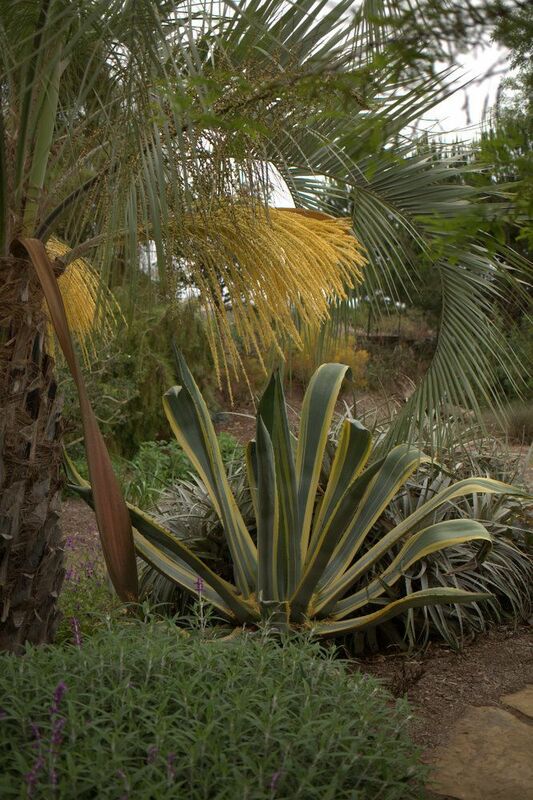 Detail of the shrub in the lower left of photo above. Some sort of calluna? Highway 101 traffic north to Santa Barbara never gets any easier, and this was a graduation weekend for the UC, something to keep in mind for a June visit. 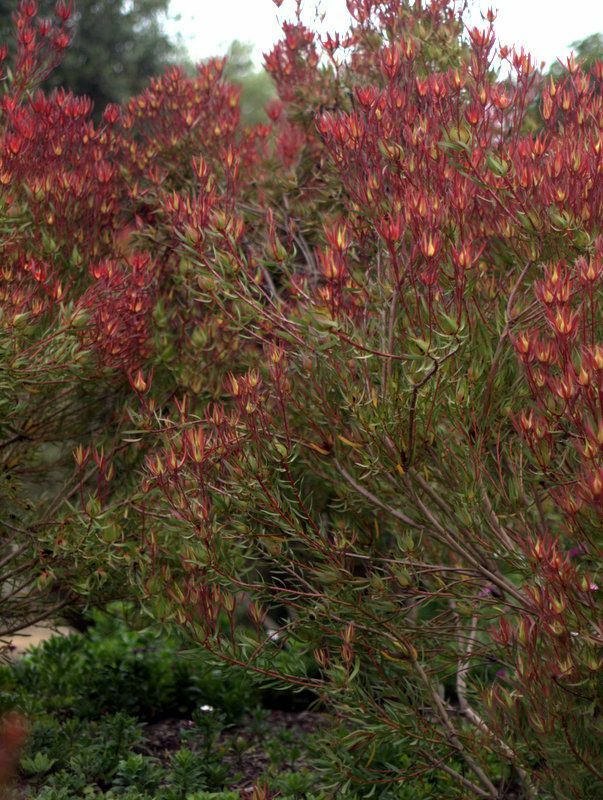 This entry was posted in garden travel, garden visit, plant nurseries and tagged Alstroemeria 'The Third Harmonic', Leucadendron salignum ‘Summer Red’, Lysiloma thornberi, Salvia cacaliifolia, Seaside Gardens. Bookmark the permalink. 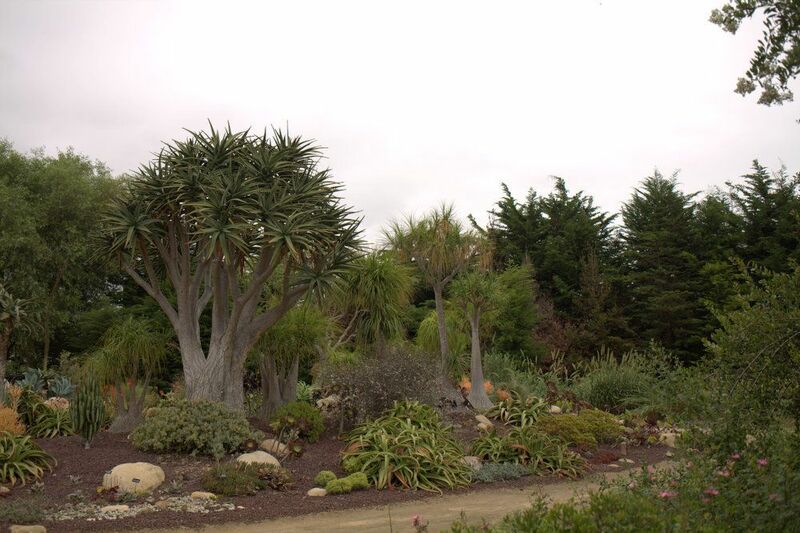 10 Responses to Seaside Gardens, Carpinteria, Calif.
I’m so glad you got to spend a good amount of time at Seaside Gardens. I was there this March but I only had a couple of hours. 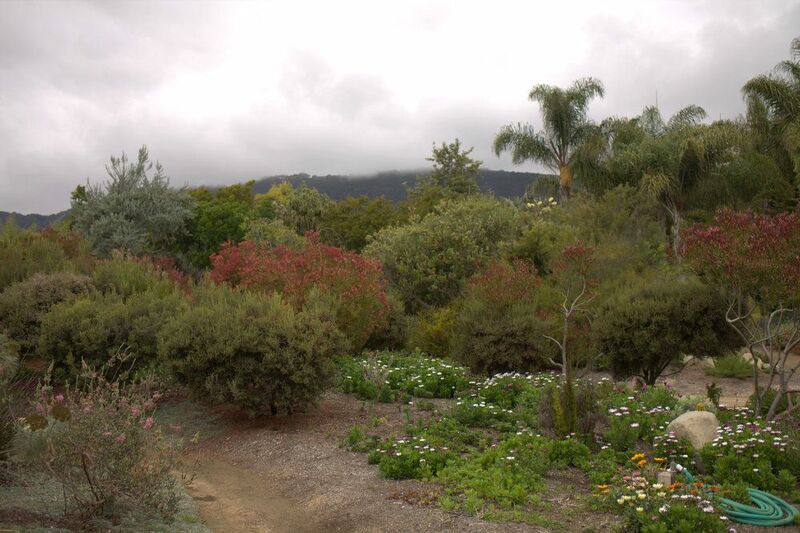 But that was enough to declare this a must-see destination for anybody visiting the Santa Barbara area. My older daughter will go to college in Santa Barbara starting the fall of 2016 and I’ve already threatened her with frequent visits, LOL. 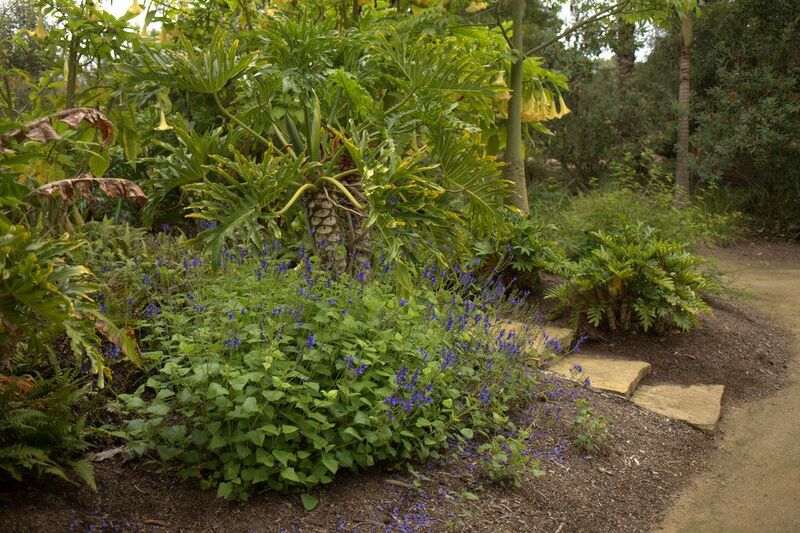 I’m never going to look at another thriving Brugmansia without thinking of those steps… LOL! I think the sprectre of climate change might be adding another dimension to this drought. Nor was the lawn removal seen to the extent it is now. There have been 4 taken out so far this year in my neighborhood, and a few more that are being left to die-perhaps to be replaced with something else. 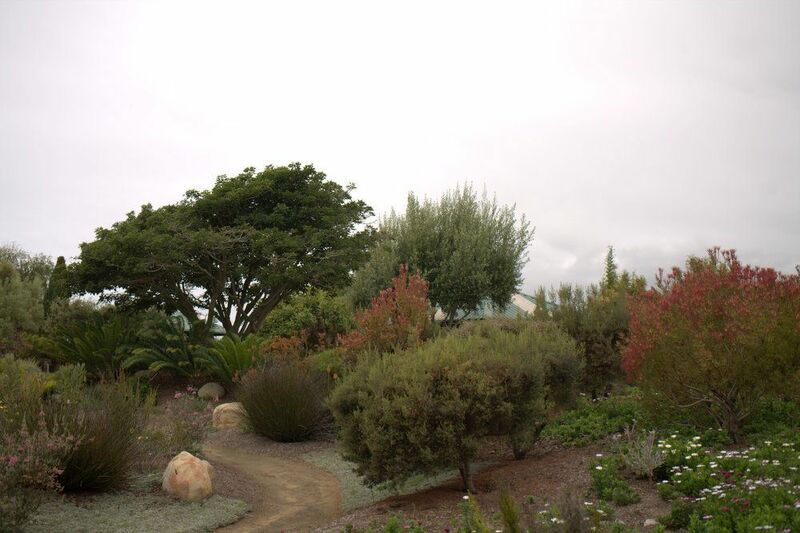 How nice that a little June gloom came to play for your photos at Seaside. I’m way overdue for an SB trip. Yep, that’s it. 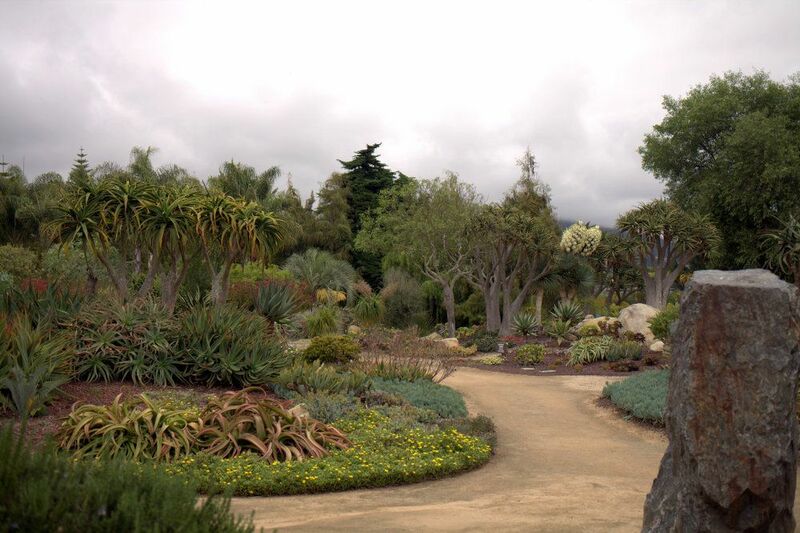 Must plan a return to Santa Barbara soon! Thanks for the virtual visit. Not only climate change, but more and more humans crowd our state, and California agriculture has become big multinational corporate business. I continue to marvel at how everything has grown there, having first visited when all the plants were knee-high or shorter. I swoon for that cool overcast on this hot day. 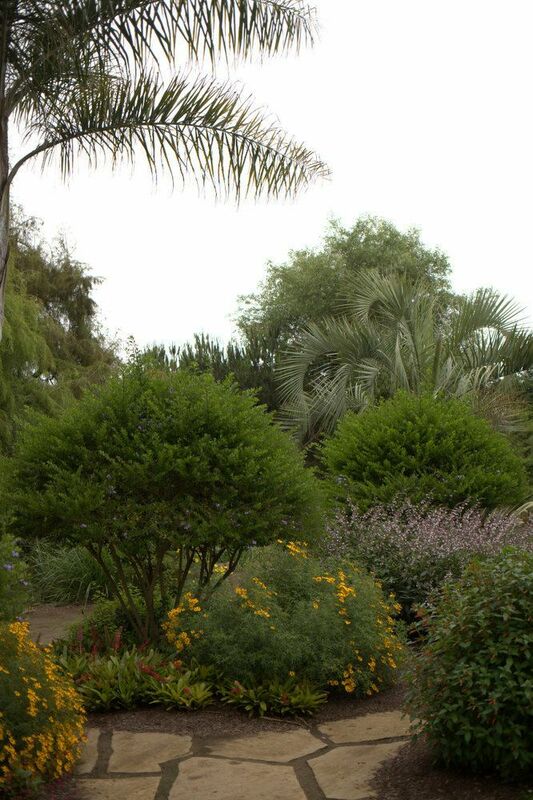 The growing grounds must have been a treat–so, what did you acquire besides the Alstroemeria? You got great pictures under the June gloom. 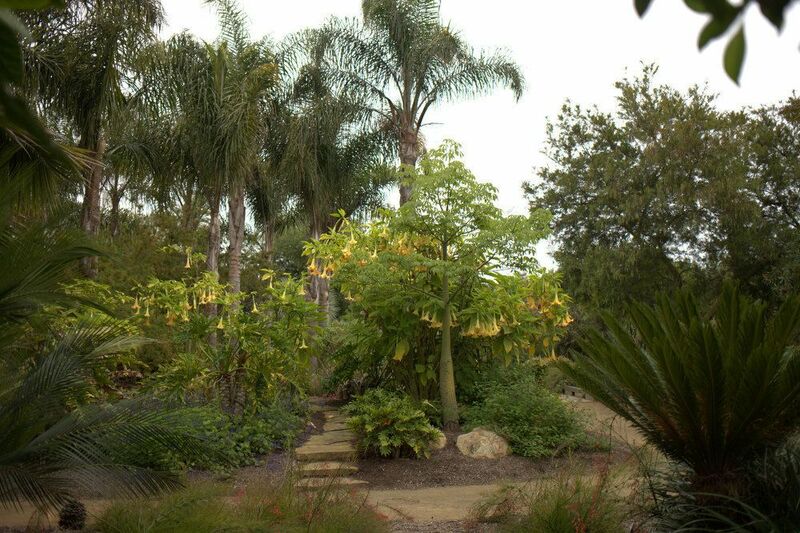 I’ve never seen those Brugmansia in bloom – impressive! 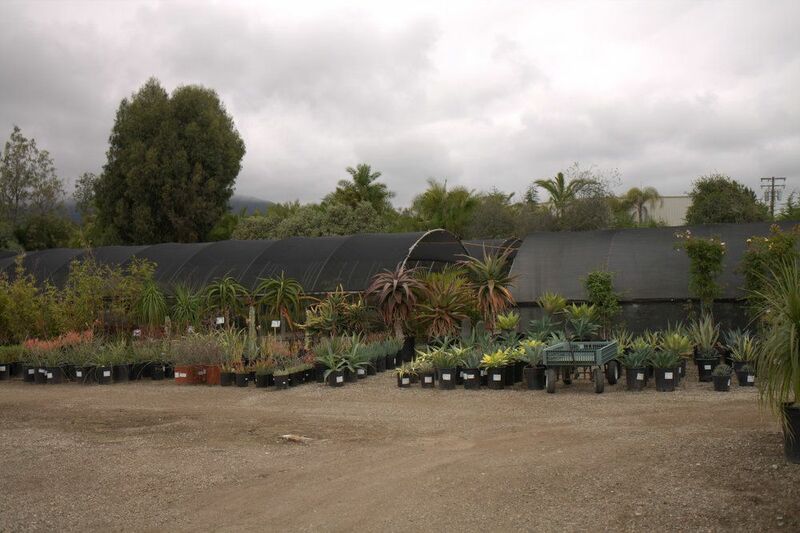 Seaside is one of my favorite nurseries and I try to get there in fall and early spring. That ritual usually involves a stop at Sperling on the way home but, sadly, Sperling has been sold (to a blasted car dealership) and is expected to close in or about September. @Gerhard, so nice of your daughter to attend college in such a fortuitous location! @Nell, seriously! The steps and the brug just had a sinister quality together. @Kathy, SB is such a lovely area, but all that traffic squashed into the 101 corridor is giving it a theme park feel to me. @Loree, yes, we should plan a visit, all the commenters! @Gail, I don’t think I brought home anything else but TTH. Admirable restraint, no? What an absolutely amazing location, your daughter is so lucky!! The moody light adds another element to what already looks incredibly exotic to me. Love that nursery, and the fog in your photos is very familiar up here in Berkeley too, except May was foggy, June has been quite a bit sunnier. Third Harmonic Alstroemeria is a staple of mine, combined with other vigorous tall growers such as A. aurantiacum. I happen to like 5 foot tall Alstroemeria, but it does require essential space, and equally vigorous neighbors.